(Nanowerk News) Random thermal fluctuations in magnetic memory can be harnessed to reduce the energy required to store information, according to an experiment reported in the current issue of Physical Review Letters. The development could lead to computer memory that operates at significantly lower power than conventional devices. Markus Münzenberg of Universität Göttingen and Jagadeesh Moodera of MIT describe the potential route to greener magnetic memory in a Viewpoint in the latest issue of APS Physics. 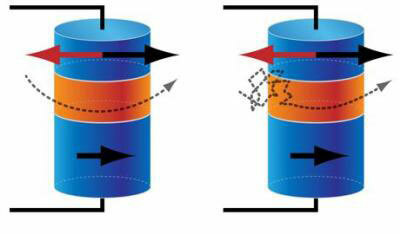 This is a schematic of data storage in (left) converntional magnetic memory and (right) thermally assisted memory. Heat is usually a problem when it comes to storing digital data. At the microscopic level, the molecules and atoms of anything at a temperature above absolute zero are in constant motion. Because magnetic memory relies on controlling and measuring the orientation of tiny magnetic particles, the jostling that comes about as components warm up can potentially scramble data. Thermal issues are a major concern as researchers build increasingly dense and fast magnetic memory. But heat isn't entirely bad, according to a collaboration of Italian and American physicists that has shown that random thermal motions can be helpful for writing magnetic data. Essentially, they found that applying an electrical current that should be too modest to record data can still be effective for writing information because thermal motion gives an added boost to help orient magnetic particles. The researchers confirmed the effect by measuring magnetic fluctuations as the particles that make up memory were being aligned. Thermal motions are random, which in turn causes random variations in the amount of time it takes for magnetic particles to line up. The fact that alignment times ranged from one to a hundred billionths of a second made it clear that random, temperature-dependent motion must be at work in helping to flip the particles. The experimental confirmation of the thermal effects on magnetic memory points the way to new, thermally-assisted data writing schemes. The advances could reduce the power required to store information, potentially helping to ensure that future PCs are increasingly green machines.